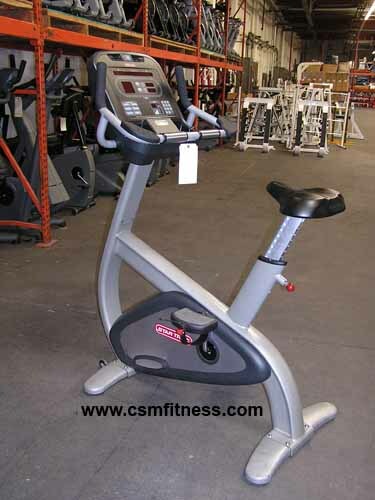 The self-powered Star Trac E-UB Upright Bike is incorporated in Star Trac’s E Series Entertainment Solution Line. Its sleek distinctive design integrates a corrosion-resistant frame that requires minimum maintenance. It includes a user-friendly console that offers 11 preprogramed workouts, with 20 different levels of intensity. Built with its users in mind, Star Trac developed the E-UB with user-preferred features like their standard personal cooling fans, convenient cup and accessory holders, and inline skate-style pedals. Additionally, it is prewired with entertainment controls and it offers users the option of adding a 15” personal viewing screen. The Star Trac E-UB Upright Bike was designed to challenge any user to their full potential while also keeping them entertained.